The Secretary or designee of each cabinet agency and a representative from the Governor's Office shall serve on the North Carolina Climate Change Interagency Council ("Council"), which is hereby established. The Secretary of the North Carolina Department of Environmental Quality, or the Secretary's designee, shall serve as the Council Chair. The North Carolina Department of Environmental Quality shall lead the Council by providing strategic direction, scheduling and planning Council meetings, determining the prioritization of activities, facilitating stakeholder engagement, and assisting in the implementation of pathways to achieve the goals provided in Section 1 of this Executive Order. f. Review and submit to the Governor the plans and assessments required by this Executive Order. Governor Cooper addressed the cabinet secretaries and their designees in the first meeting of the Climate Change Interagency Council on December 19, 2018, in the William G. Ross Environmental Conference Center in Raleigh. Each agency presented an overview of their plan to reach the goals set out by Executive Order 80. 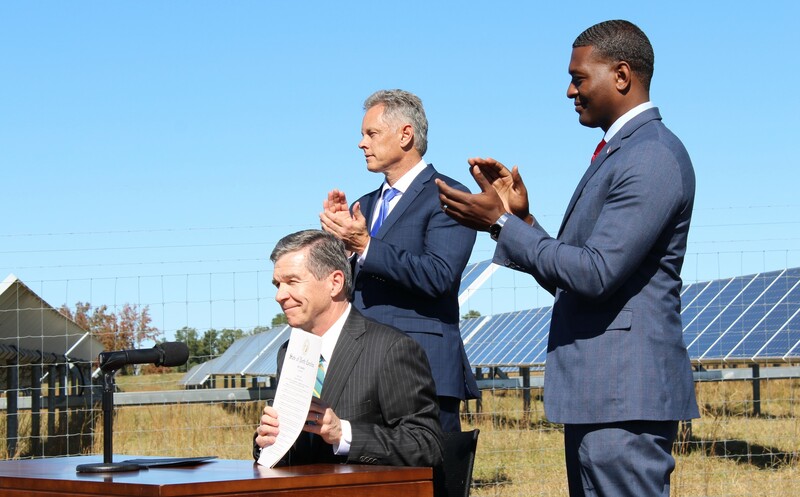 Council Chair, Secretary Michael S. Regan said, "North Carolina will only remain competitive in a global economy with innovation and investment in a more resilient state that rebuilds both stronger and smarter."